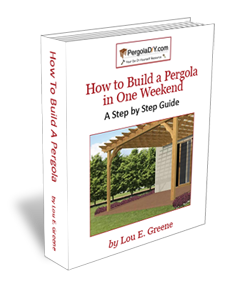 Wedding pergolas are often small, inexpensive and perhaps even temporary structures built just for one event. You can see that they have an arbor style look to them. Some have trellises on the sides where vines often grow. These white vinyl pergolas are frequently found in gardens designed to be rented out for outdoor ceremonies. They are typically built to create a backdrop to the space where the wedding party and minister stands during the wedding. Since they are small, the supporting posts can be smaller and the roof joists thinner than usual and more widely spaced apart to give a more delicate, lacy appearance. Cut flowers and vines are usually applied to match the bride’s chosen color scheme for the event. Lattice wall attachments such as those in the picture above are nearly always added to a wedding pergola. These define the space and also provide another framework for decorative flowers. 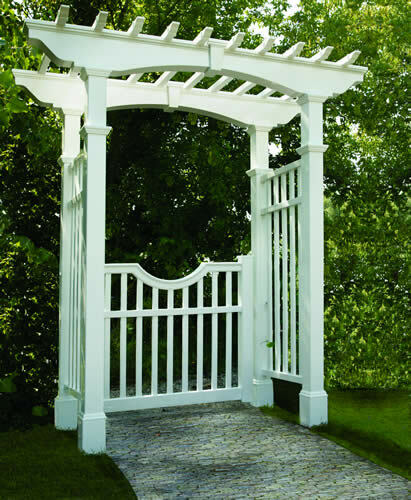 Lattice attachments are also a great option for a full sized pergola. They are very inexpensive additions that are very easy to attach. There are a few more ideas you can get from this example. Trim pieces around the base of the posts, towards the top of the posts, and even in the center of the beam create elegant lines. A gentle curve cut into the pergola beams also softens the appearance.